Valu.Supply Premium Brass Screens inside Valu.Supply Bag + Limited Edition Valu.Supply Glass Jar. These pipe screens are made of Mesh, which effectively allows freer flow of smoke and air through your pipe while keeping dirty ash from pulling through. Pipe screens prevent clogging and stop hot ash and embers from entering inner pipes, making smoking more enjoyable and cleaning a much easier task. Pipe screens are durable, so they can be cleaned and reused or can be replaced as needed to support maximum air and smoke flow. This product comes with a Limited Edition Valu.Supply Glass Jar! Valu.Supply products are backed by a name you can fully trust! Valu.Supply's goal is very simple - Offer Extra Low Prices with Top Notch Service & Huge Variety. With customers all over USA, Valu.Supply's Quality, Price, and Services speak for itself. Valu.Supply aims to please each and every customer individually and appreciates all their supporters. 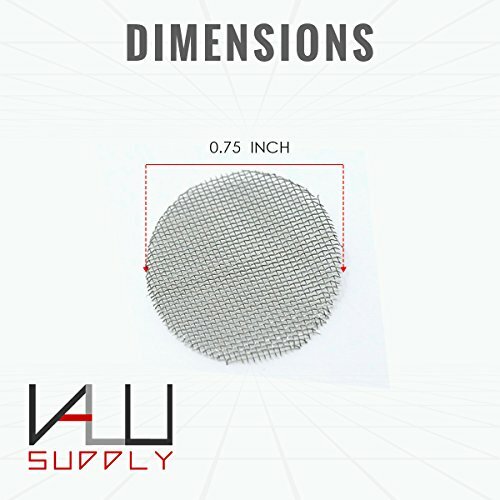 Check out all of Valu.Supply products today! All images Copyright. All Rights Reserved. View More In Pipe Screens. If you have any questions about this product by Valu.Supply, contact us by completing and submitting the form below. If you are looking for a specif part number, please include it with your message.